You will take Exit 83 (Sutton Road) Turn left onto S. Sutton Road towards Fort Mill. Stay on S. Sutton for less than a mile. Turn right onto US-21 S. Bypass. 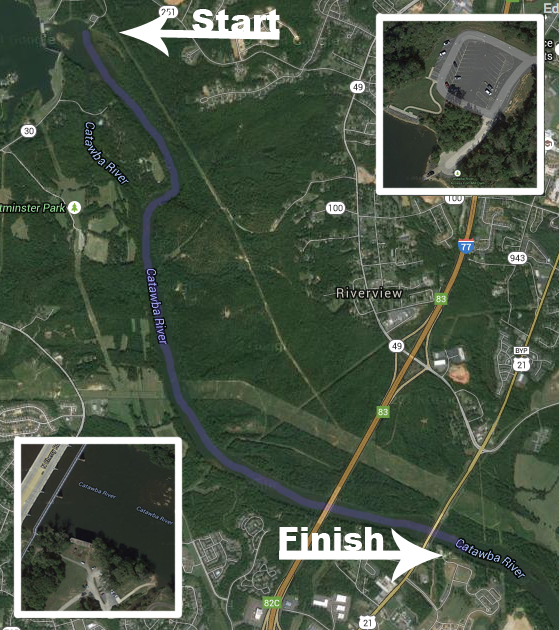 In half a mile you will turn left onto Dunkins Ferry Road. Follow Dunkins Ferry Road until you hit a round about and take the round about to Riverwalk Parkway towards the Rock Hill BMX Super Cross Track. From there unload your group (unless they are small children), supplies, and anything you need to make this a memorable experience. If you need a list of what to bring and not to bring you can find these items here! One driver from the group and/or party will drive to the Rock Hill BMX Super Cross Track lower parking lot. When we arrive at the BMX Track we will shuttle you back to the Dam so you may enjoy your adventure.